Eat Hackney has already blogged about the joys of Palm 2, Hackney’s favourite cornershop. But it’s take her a wee while to get to the shop’s gorgeous new upstairs space where they have been running successful and varied food-related events for the last year. Last week Tacochu popped up at Palm 2, with a sell-out celebration of spring in Japan. Sushi, soba and plenty of sake were on the menu. Erica Dorn started Tacochu as a street food stall focusing on taco rice, the Japanese/Tex Mex fusion that resulted from the US occupation of the island province of Okinawa. 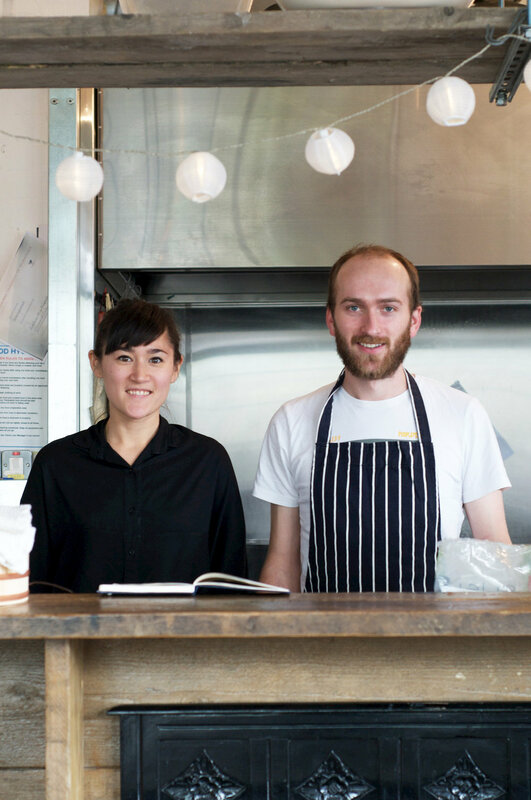 Noting the lack of Japanese restaurants in Hackney and the general tendency of Japanese eating places to concentrate on fancy food, Erica held her first supper club in a Morning Lane café. She aims to share katei-ryori, or family cooking – homely, healthy and comforting. Here are some great recipes from Erica, for sea bream sashimi salad and edamame burgers. You can use any sashimi if sea bream is not available, and salmon is good too – just make sure you ask your fishmonger to make sure it’s sashimi-grade. At Fin & Flounder, Steve Hatt or Jonathan Norris you won’t have any problems finding very fresh ingredients, or if you’re feeding an army there’s always Billingsgate! Julienne the carrot, leek and celery, and soak in ice water for 10 min so they remain crunchy. Drain and pat dry with a kitchen towel. Transfer to a large plate. With a very sharp knife, slice the sea bream fillets into 5mm thick slices. Try to do it in one motion if you can, rather than sawing. Space the sliced sashimi on top of the vegetables. If you have a main dish to make, then store in fridge until ready to eat. Heat the sunflower oil in a wok to about 180°C. Drop the wonton skins in and fry until crisp, then break over the top of the salad. Mix the dressing ingredients together and drizzle over the salad. Roughly chop the peanuts and sprinkle on top. You can use breadcrumbs instead of rice crumbs but Erica finds that rice crumbs are a better binding agent. They’re also gluten free. You can have these burgers on their own with a little soy sauce, or in a proper burger with tomatoes, lettuce and a bit of Greek yoghurt. If you freeze them, make sure they are defrosted before you fry them, so that they heat all the way through. Fry the onions until translucent. Finely chop the mushrooms and fry with a little oil. Put half the edamame, all the garlic cloves, cashew nuts, egg, salt and pepper into a food processor and blend. Roughly chop the remaining edamame and combine with mushrooms and the rest of the ingredients, including rice crumbs. Shape into oval patties and fry in a non-stick pan with a little sesame oil, or freeze for later.